Pinning models can be time consuming... but it's worth every second you invest. The opportunity to pin the wings on a Forge World Bloodthirster is one of those hidden benefits you get when you buy the model. Along with lots of other benefits like trying to attach a hundred little spikes. All fun things to do before you actually get to use your model in a game. I've done this once before for a friend of mine. Another person saw what I'd done before and wanted it done for his model. Not that pinning a set of wings is any great accomplishment, but I made these so they could be removed for storing the model. It was a matter of using multiple pins in each wing so that they can be fitted on snugly and then removed afterwards. It's one thing to pin them in place for stability, but making the wings permanent makes for some interesting transporting problems. This is a huge model to carry around. Keeping them removable makes it much easier to transport this guy to and from the game store. The double pin at the top of the wings is the key part. It keeps the wing nice and snug when it's fitted into position so you can actually use the model in game play without worrying that a wing is going to drop off in the middle of some giant hand-to-hand combat and damage a half dozen models. I was also asked to "adjust" his right hand so his axe did not hit his right wing. That meant rotating it slightly (not so much it looked wrong) and tilting it so it cleared the wings. 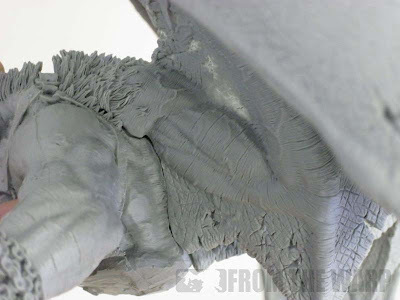 This means there are no problems with adding or removing the wings each time the model is used. A simple pin with some greenstuff to fill in the gap and the wrist was as good as new. I used some floral wire for added rigidity and my GW drill bit. The wire is slightly larger than the hole I made (using the standard GW drill bit) so it took a pair of pliers to push the wire in. I did not glue the wire in place either. 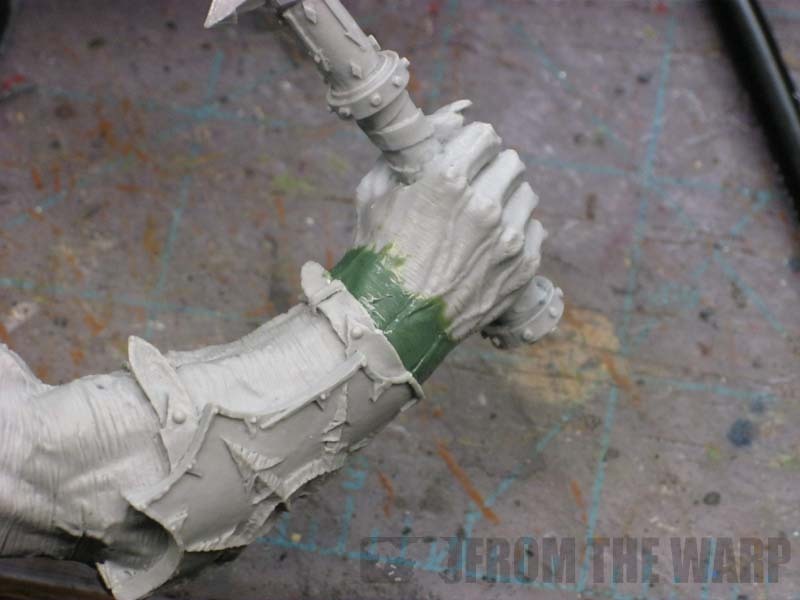 This gives the owner the option of removing them at a later point without worrying about damaging the model. The double pin at the top of the torso is the floral wire bent in half inside a slightly larger hole. The floral wire allows me bend it as needed so that I can create friction between the pin and the holes in the wings to hold them in place. The top pin is doubled up for some added strength. I'm sure a single pin would work, but I wanted to make sure this guy would hold up to game play without having to worry about the wings coming off. Yep, there's a small gap between the wings and the body even when they are fitted in perfectly. And this is okay. During game play, you never even notice it. Before I pinned the wings in place, I sat there and kept working on both surface areas where the wings and the torso join so they match up as close as possible. Some cutting here, some sanding there... all to get them to match up as close as possible to minimize this left over gap. It would be the one small drawback to having the wings pinnable and removable at the same time. I guess you could say this isn't technically pinning in the sense that nothing is permanent, but I like the ability to remove the wings for transport as needed. I think it adds to the model and it's usability. is this like the 40k version of 'Pin the tail on the Donkey'? Good tips! I know I've started using pins more and more in my models for stability. Thanks for the helpful hints. = not fun. Im glad I got Seths! Atreides: Kinda... except this donkey can wreck your army in one swift move. Fayte: This is just one way to pin. There are lots of ways to go about it. I think the biggest thing is doing whatever you need to so that those fragile joints are reinforced enough so you don't have to worry about the model during game play. Man Boy Genius: Was his already built? I can't imagine trying to transport the thing with the wings on. That's a carrying case all on it's own. I'm not sure I'd want to tackle a Titan either. The amount of small parts must be overwhelming. I did something very similar with a nurgle demon prince and wings recently. Instead of pins though I used two magnets. I also applied lots of lubricant to one surface so I could sculpt where the wings meet the body and have it removable to minimize the gap in between the two parts. Thanks for sharing this. I hadn't though of just using pins to hold removable parts. 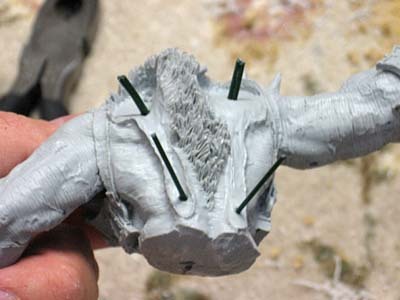 as an addition to your pins on the bloodthirster, you could add a magnet between the pins to help keep the wings in place during the game. I ended up having to do that with my Hive Tyrant with wings after using 2 pins per wing when they started getting knocked off in the heat of battle. Granted your pins are longer than mine so it may not be strictly necessary. If you only got a tiny gap, you're lucky. 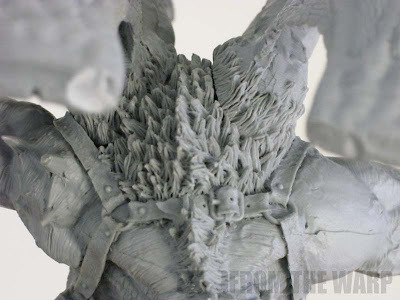 The one I got from FW had horrible shrinkage in most areas, I swear on mine there's almost as much GS on the goddamned thing as there is resin now. Cameron: I opted to go away from the magnets due to the weight of the wings. Even though they're resin, they weigh a good bit and would probably need some substantial sized magnets. Blaise: Fortunately I've found that you need to pull the wings off in this setup. They aren't going to "fall off" during play because you can adjust the pins to increase the friction in the holes and make the fit super tight. Faolan: The gap started out bigger. When you first look at the wings and the torso, they look like they should go together nicely... then you start trying to actually put them together and realize they don't quite match up as well as you thought. It took me a good bit of cleaning to get them to this point so I know what you mean. Ron did this for me. I am grateful due to the fact that I didn't want to tackle it myself and screw something up since I have never done it before and the model costs over $200. lol. You did a great job Ron and I will send you some pictures when it is complete. Like I told you before though, it will be a while off since I haven't even started it yet. haha. Lack of time on my part. I am anxious to do it though. Btw guys, the pins he used work great and hold the wings very well. Shane: Glad it worked out so well for you. It was fun to do and I hope he does well on the tabletop for you.